This compost bin is the perfect starter bin for composting food waste right in your home. The All Seasons Indoor Composter® is a unique, indoor-compost system of bokashi composting used to recycle kitchen scraps into an organic compost soil conditioner. The All Seasons Indoor Composter® can be easily implemented in an indoor environment, which lends itself well to sometimes hard-to-compost-in environments like an apartment, school, household, restaurant, business or wilderness use. 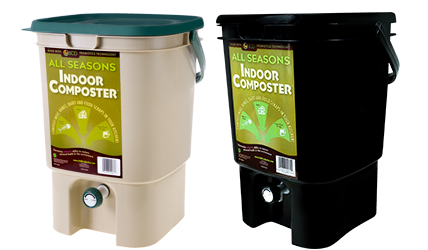 The All Seasons Indoor Composter® is a unique indoor product used to recycle kitchen waste into an organic compost soil conditioner. The most effective method of fermenting is through anaerobic (without oxygen) fermentation. This process prepares the scraps for burial in less than half the time of conventional composting methods without any unpleasant odors. Used in conjunction with All Seasons Bokashi™ or All Seasons Liquid Bokashi™ (sold separately), this indoor compost bin provides the ideal conditions to activate anaerobic fermentation that accelerates the composting process, while eliminating odors and deterring flies. The All Seasons Indoor Composter includes two unique features: the strainer and spigot. The spigot allows the moisture released by the scraps of food waste to be drained to prevent spoilage. This liquid can be used as a fertilizer or to clean your kitchen and bathroom drains. All Seasons Indoor Composter dimensions: 16"h x 10"w x 10"d.
To initiate indoor composting: Lay down an initial layer of All Seasons Bokashi. Place fresh food scraps in the All Seasons Indoor Composter and thoroughly coat every layer with Bokashi compost starter. Close the bin’s lid tightly after every use to ensure an anaerobic (closed-air) environment. Once the container is filled to capacity, bury the compost directly in the soil. Or let the food waste continue to ferment for two weeks, draining the liquid compost tea every 1-3 days. Then transfer the compost from your bin to your garden or planter. Allow at least two more weeks for the fermentation process to continue in the soil before planting your favorite veggies, flowers, trees, etc. Place the bin under the kitchen sink or other convenient location; perfect for any size household. *Not suited for outdoors, as extreme temperatures change or halt the fermentation process of the anaerobic system). Price: Check with your favorite online or local retailer for pricing information. Beware of Counterfeit SCD Probiotics Indoor Composter Products! Please beware of counterfeit SCD Probiotics’ products online. SCD Probiotics All Seasons Indoor Composter® is being imitated and sold at inferior quality through Amazon and other unauthorized channels. These inferior knockoffs are not produced by or for SCD Probiotics or under its control. These products do not meet SCD Probiotics quality standards and are not covered by SCD Probiotics warranty. The All Seasons Indoor Composter® is made with high- quality materials, including components such as our spigot and tight fitting lid, and some models contain recycled plastics. When purchasing the product, look for SCD Probiotics® logo. Purchase through an authorized retailer or call the SCD Probiotics customer service line to place your orders. Please report any suspicious products to Customer Service at 913-541-9299 or customerservice@SCDProbiotics.com.